Abstract painter, Chloe York earned her BFA from Memphis College of Art in 2012. She has displayed her work in over 100 group and solo exhibitions throughout the mid-South and her solo exhibit, Decorators was named one of Memphis’s top ten visual art exhibits for 2013. 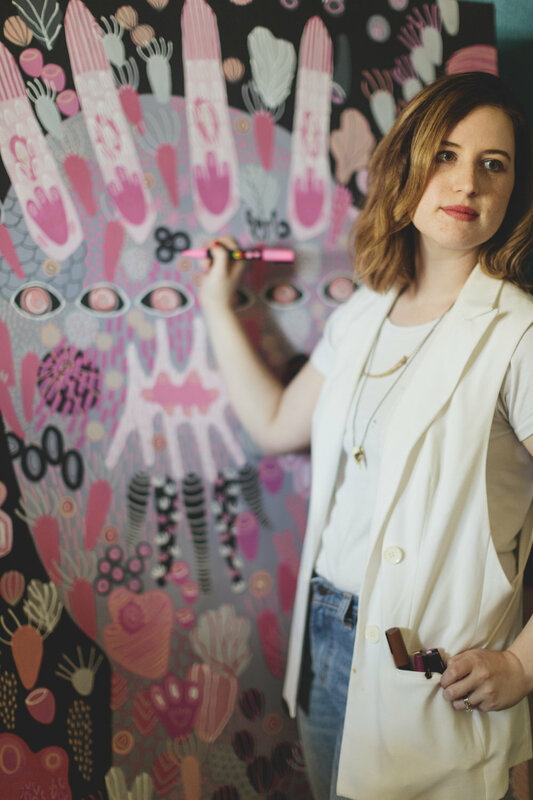 She has created work for St. Jude Children’s Research Hospital and has partnered with West Elm and Amy Howard at Home. She currently resides in Birmingham, AL with sculptor, Eric Quick and ferocious daughter, Echo in their shared home and studio. My work explores identity, outward appearances, and the manner in which we decorate ourselves. WBRC Birmingham. Fox 6 News. Live with Jeh Jeh Pruitt. Birmingham Art Crawl. December 24th, 2018. Number: Inc Magazine. “Nashville: "June, July, and August.” September 29, 2018. Birmingham Mountain Radio. “Oh Brother Radio Show.” Live interview regarding Birmingham Art Crawl. September 27, 2018. AL.com. "Cool Things to do in Huntsville." July 30, 2018. Sweet Home Alabama. Alabama.travel. "Art After Hours: Huntsville and Decatur." August 1, 2018. Nashville Arts Magazine. "August Crawl Guide." August 1, 2018. Latest News Line. "First Saturday Art Crawl, more things to do in Nashville." August 1, 2018. Tennessean. "Check out 'Memphis' musical in Murfreesboro, Third Coast comedy in Nashville and more." July 11, 2018. Nolan, Joe. Nashville Scene. "Crawl Space: July 2018." July 5, 2018. Nashville Arts Magazine. "Events: July Crawl Guide." July 2018. Aura Literary Arts Review. Spring 2018 issue. Create! Magazine. "Studio Sundays: Chloe York." May 27, 2018. Weeden, John. "Snapshot: Chloe York Paintings." Weeden Arts Watch Blog. February 12, 2017. Rhodes, Maddie. "14 Locally Made FINDS from Memphis Makers." StyleBlueprint. May 16, 2017. Ray, Julie. "Five Things to do this weekend in Memphis: April 7th-9th." Memphis: The City Magazine. April 6, 2017. Koeppel, Fredric. "Chloe York’s Seascapes Invite Cool Contemplation at Playhouse on the Square." The Commercial Appeal, June 21, 2016. Art Garage. "Chloe York and Eric Quick Collaborations. 2016. Vega, Britney. Riverblood Magazine, December 2015. Checking on the Arts. WKNO. 2015. Amy Hartelust Fine Art. June 3, 2015. http://www.amyhartelust.com/blog/2015/6/3/artist-to-artist-chloe-york. Maish, Kathryn. "Hello, Chloe York." Visual Memphis. May 28, 2015. Koeppel, Fredric. "Traditional Art Forms Such as Drawing and Painting Continued to Thrive in 2014." The Commercial Appeal, December 30, 2014. Koeppel, Fredric. "Memphis College of Art Alumni Show Testifies to Creative Impact on the Community.” The Commercial Appeal, 2014. Maish, Kathryn. "What's in Your Studio, Chloe York and Eric Quick?" Visual Memphis. June 21, 2013. Koeppel, Fredric. "Best of 2013: The Year’s Top Art Exhibits." The Commercial Appeal, December, 2013. Townsend, Eileen . "Art This Week: Low-Brow, High Tides, and Steamrollers." The Memphis Flyer, September 10, 2013. Koeppel, Fredric. "MCA's 'Blurring Dimensions' and 'Decorator' are must-see exhibits." The Commercial Appeal, September 5, 2013. Butcher, Dwayne. "Never Stop the Celebration." The Memphis Flyer: Exhibit M. March 14, 2013. Butcher, Dwayne. "Downtown Art Openings and Everywhere Else." The Memphis Flyer: Exhibit M. November 30, 2012. Memphis College of Art. “Holiday Card.” 2012. Kendrick, Joseph. "Featured Artist of the Week: Chloe York." The Electric Beef. October 31, 2012.